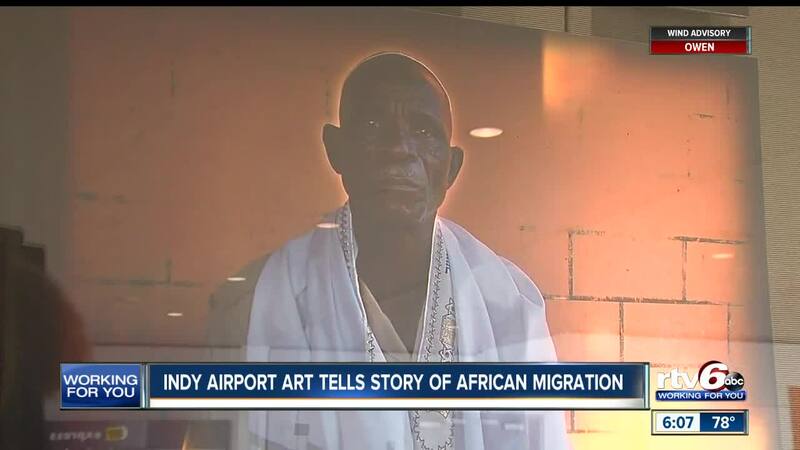 Indy Airport art tells story of African migration. INDIANAPOLIS — As part of the Indianapolis International Airport's rotating art exhibition, a story of origin and watercolor will be on display for the spring and part of summer. In partnership with the Arts Council of Indianapolis, the airport's latest exhibit hosts photographer and digital artist Bill Rasdell's fine art and documentary images influenced by migration. The Arts Council of Indianapolis says that the core of his airport exhibition is his study and reflection on the migration of the Israelites to the continent of Africa more than 2,500 years ago. Deeper than that, how this journey thousands of years ago ultimately affects contemporary African Jewish societies. Rasdell reveals how cultures can enrich food, religion, language, and the arts. “These exhibits mirror the diversity and unity we find simultaneously in travel, which connects us to history, beauty and one another through time and place,” Mario Rodriguez, Indianapolis Airport Authority Executive Director, said “We believe art and its expression is an essential part of the customer experience for the more than 9 million people who travel through the Indy airport each year." The exhibition features images from his travels to visit and document four main groups: Ethiopian Jews, the Abayudaya of Uganda, the House of Israel of Sefwi Wiawso in Ghana and the Lemba of Zimbabwe. This exhibition is located in the Concourse B exhibition case and will be on display until July 14.